Low impact mum and baby class in a warm safe studio setting surrounded by other mums, allowing you to ease back into fitness without worrying about a babysitter, yes – you can bring the baby along! A full body, non contact boxing workout. improves strength, power, fitness and muscle tone in one energy packed punch. Yoga-pilates flow based class with basic stretching movements for beginners. Build that bootilicious backside and toned sculpted legs using barbells, body weight exercises and resistance bands. Our interval based cycle session for a sweaty spin 30 minutes! The world’s favourite high energy latin/international dance fusion for the most fun aerobic workout you will ever have. Circuit style class to improve strength and fitness on our state of the art custom made rig. A seriously fun fill body workout suitable for all. A fun cardio dance session for those who like to move to music to step up their fitness. High intensity interval training using bodyweight and resistance exercises to spike heart rate and boost metabolic rate for the ultimate fat burning combo. Old school style spin to music, no cards, no zones, no watts, just SPIN. Your favourite instructors leading the weekend cycle sessions, making the most of your winter weekend mornings. A bonus cycle session, a little later for those who want to stay in bed a little longer or add back to back to our Sunday cycle for a twin spin super session. Max effort, max fat burning, max fitness guaranteed. Welcome to DKIT Sports high intensity 40 minute circuit session in our high performance unit. 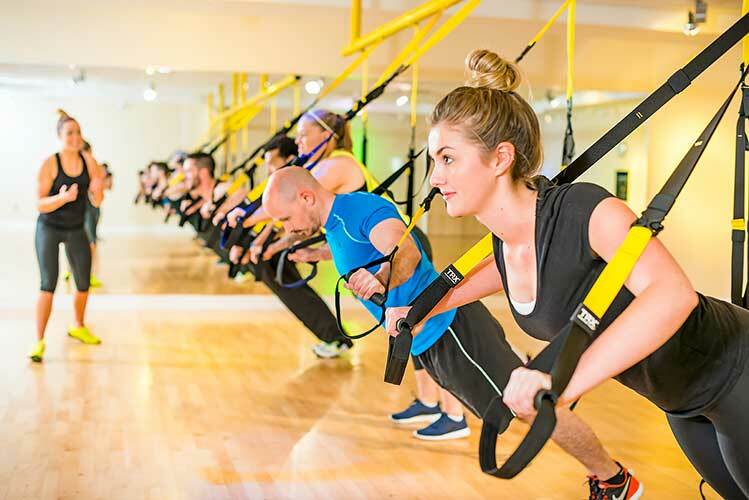 A suspension based total-body fitness program that simultaneously develops cardio, core strength, balance, flexibility and joint stability. This class has it all! Total body strength, conditioning and cardio work for improved mobility, ability and performance. An early morning high calorie burning indoor cycle session to really wake the body and mind. Blast into your day and boost your energy. Indoor Cycle cardio class and calorie burning to improve fitness, power, strength and endurance on our state of the art stages indoor cycle bikes. Suitable for all. Step your feet to the beat of the music using the legendary step. Sweat up a storm in this fun and energetic class. Barbell based resistance training class for total body toning and tightening to sculpt a leaner and stronger physique. This 15 min class takes you through a series of ab exercises to help sculpt those abs you make in the kitchen.